I'm pretty pleased with myself for perfecting this recipe. 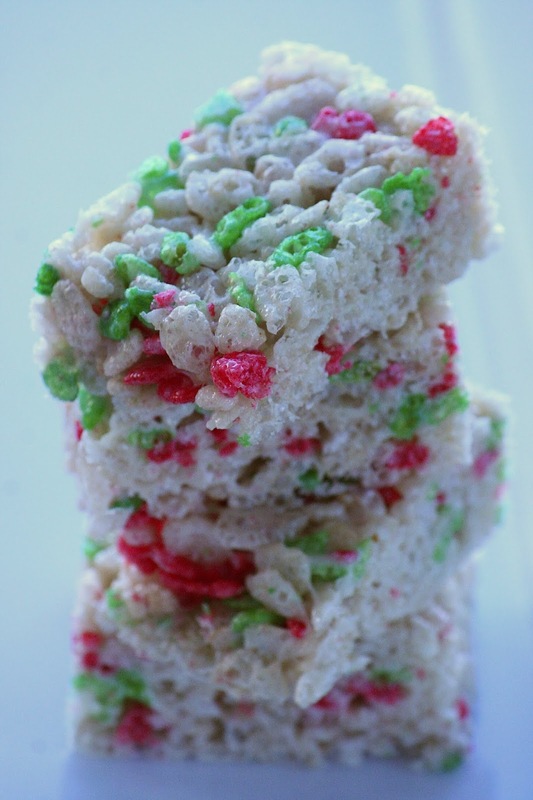 Turns out, it's a lot harder making the classic Rice Krispie treat than you'd think. Previous versions were too wet and thus sogged the cereal, or the sugar re-crystallized and the whole thing fell apart. But these! These have the perfect blend of crispness, sweetness, and chewiness that defines this childhood classic. These freeze and thaw very well should you need to make them ahead for a holiday party. Line a baking sheet with parchment paper and lightly grease it. 1. Place the aquafaba in a small saucepan and bring to a boil. Reduce the heat and simmer until reduced to 1/2 cup. Pour into a mixing bowl (of a stand mixer if you have one) and let cool to room temperature. Place the bowl in the fridge to speed this up if you'd like. 2. When aquafaba is cooled, sprinkle in the xanthan gum. Whisk to stiff peaks with a hand mixer or stand mixer. Whisk in vanilla extract until incorporated. 3. Add sugar, water, corn syrup, and agar powder to a small sauce pan. Bring to bubbling over med/med lo heat, stirring constantly to keep the mixture from sticking to the bottom of the pan. Bring the mixture to firm ball temperature: 245 to 250 F (use a candy thermometer). Be patient. The temperature will rise, then plateau, then rise again. Resist the urge to crank the temperature up. 4. Once the sugar mixture has reached firm ball, whisk it into the aquafaba by drizzling it down the side of the bowl with the mixer running (I like to use a hand mixer for this part for greater control). Once all of the sugar had been incorporated, keep whisking until the bottom of the bowl is no longer hot (I like the stand mixer for this part). 5. 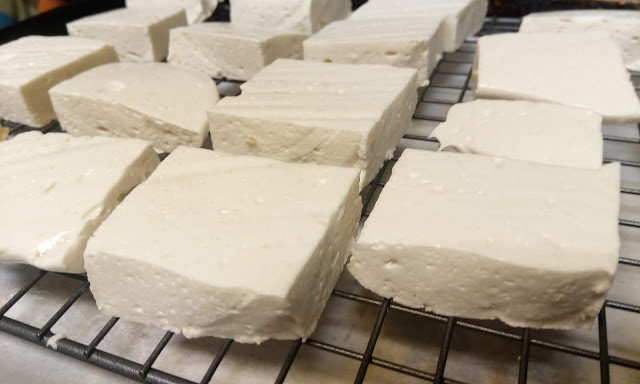 Transfer the marshmallow to the prepared baking sheet and spread to about 1/2" depth. Let fully cool. 6. Once fully cool, lightly grease the top of the marshmallow. Cut into 2x2 squares and transfer to a cooling rack. Let dry at room temperature for at least 12 hours. 1. Melt the margarine in a large pot over lo/med lo heat. Once melted, add the marshmallow pieces. Once again, be patient. Stir with a wooden spoon until all melted and smooth, then stir in the vanilla. Remove from heat, add in the cereal, and mix well. 2. Press the cereal mixture into the prepared pan with a silicon spatula. Allow to fully cool, then cut into squares. Enjoy! 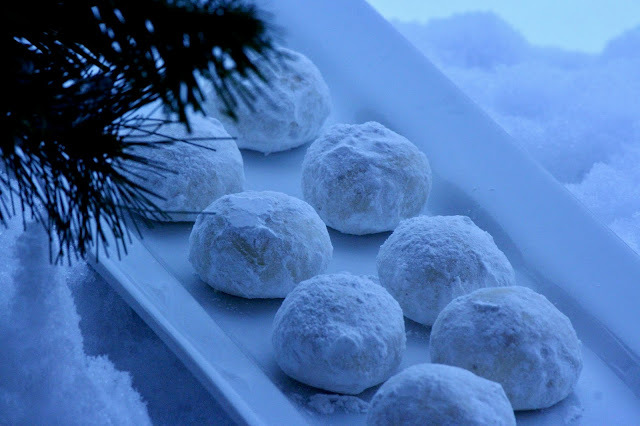 This is a fairly familiar Christmas cookie--nuts, fat, and flour coated in icing sugar. Growing up we had something like them called Russian Tea Balls. I like this version because the almond flour makes for a more crisp and smooth cookie than the one of my childhood. These are flavoured to be reminiscent of eggnog, but you could leave the nutmeg out of you'd like. 1. Whisk together almond flour, corn flour, nutmeg, and icing sugar. 2. Add margarine and mix into a smooth paste with a wooden spoon. Add rum and extracts and mix well. 3. Add flour and mix with the wooden spoon into a ball of dough. 4. Roll 2 tsp of dough into balls and place 1" apart on the baking sheets (2 dozen per sheet if they are big enough). 5. Refrigerate the balls of dough while you preheat to the oven to 350 degrees with the racks in the top and bottom third of the oven. 6. Whisk remaining icing sugar and nutmeg in a medium bowl. 7. Bake for 20 mins, rotting the pans and switching racks after 10 mins. Cookies should be dry and firm and very slightly browned. 8. Let cool for 5 mins, then toss in batches in the icing sugar mixture. Let fully cool on a wire rack. If you are going to freeze these for later, do it now. 9. Toss again in the icing sugar before serving. I am emerging from a large research project just in time for the holiday season. So, the plan is to post as many holiday-themes recipes as I can in the next 3 weeks. It's going to be mainly baking, of course, but that's not a bad thing. 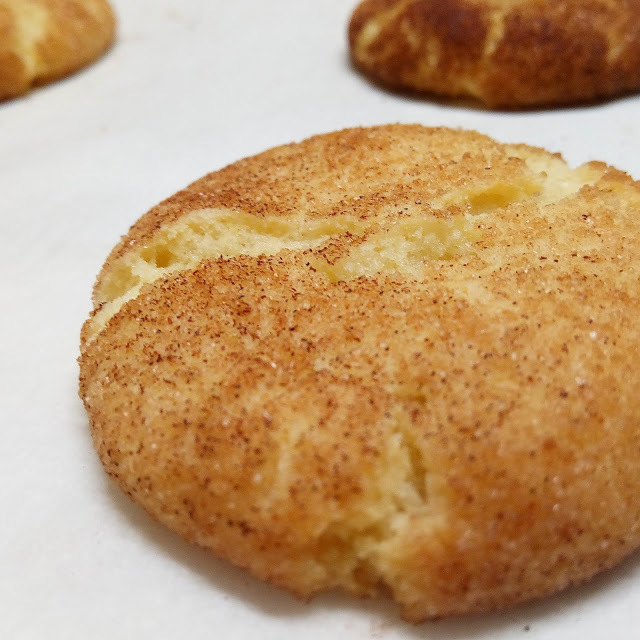 First up are these snickerdoodles. They are basically a veganized Betty Crocker recipe with added nutmeg and rum for an eggnog-y taste. Remove both and you have a regular snickerdoodle. These are both crisp and chewy thanks to the magic of aquafaba, and are perfectly sized for a holiday cookie tray. Heat oven to 400ºF. Line a baking sheet with parchment paper. 1. Cream sugar, margarine, and shortening in large bowl until fluffy (I use a heavy-duty whisk). Whisk in aquafaba, then the rum. 2. Sift in flours, nutmeg, cream of tartar, baking soda and salt. Mix into a dough with a wooden spoon. 3. Roll tablespoons of dough into balls, then roll in the cinnamon-sugar topping to coat. Place on the prepared baking sheet. 4. Bake 8 to 10 minutes. The tops should be cracked and not too wet looking. Let cool on a wire rack.